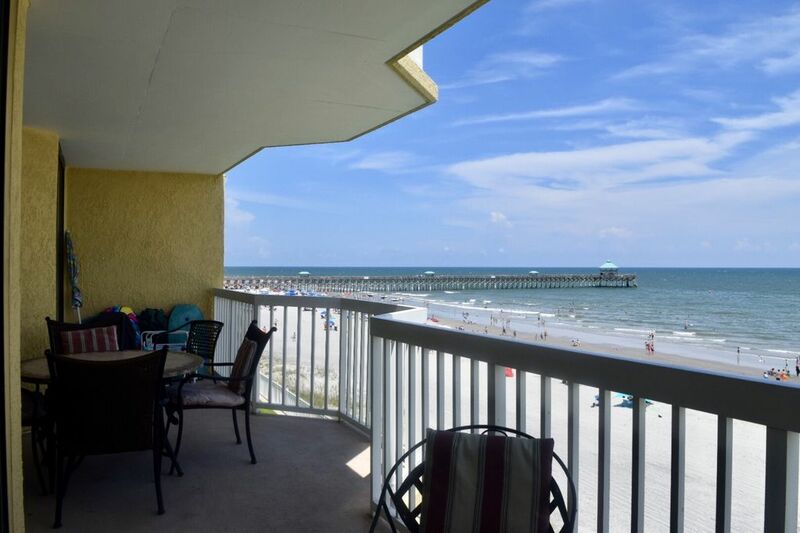 Approximately 50 feet from the Atlantic Ocean, you can relax on third floor balcony watching and listening to the waves roll in, sun yourself at oceanside pool, or swim in the ocean. Folly Beach is a charming island town, just 12 miles from Charleston. The condo is within walking distance of dining, shopping, and South Carolina's longest fishing pier. From the comfort of the master bed, you can see and/or listen to the Atlantic Ocean. Access to the large balcony is through the living room or master bedroom. The property is fenced and gated, providing you extra privacy and ensuring you that parking is always available. * The Condo is Non-Smoking, and unfortunately, we CANNOT accept Pets. * No extras for Holidays. * Cleaning included in rate. * Weeks are from Saturday to Saturday. * Winter stays of four nights minimum available. * Sleeping accommodations: One Queen in Master Bedroom, one Queen, in bedroom #2 and Two Twin Beds in bedroom #3. Perfect condo for a family of four plus two grandparents! The kids loved having their own room and the three bathrooms came in quite handy. The condo was very clean and featured an AMAZING view of the Atlantic. The location couldn’t be any better. Just a few blocks away from all the restaurants, shops and pier! The restaurant a cross the street did have live music into the evening but the use of a couple sound machines felt with any excess noise with no trouble. Hope we can visit again soon! We had an awesome vacation! Great condo, clean, quiet, lots of room. Great location! Nice being right on the beach, but easy commute to Charleston for sightseeing. Within walking distance to many restaurants. We had a wonderful vacation and would recommend staying here to our family and friends. We had a wonderful time. The property was well maintained and we were very comfortable there. It was hard to leave this morning. Enjoyed very much. Look forward to planning another trip. This property is very well maintained and very user friendly. Very clean and maintained. It is a great location in Folly Beach but this unit as the extra touches of comfort and cleanliness. Would love to stay here again. Oceanfront Villa on third floor. Building about 50 feet from ocean. Two oceanside swimming pools. Short walk to Folly Beach Pier and center of town.